The 2013 Arafura Games have been deferred indefinately by the new NT GOVERNMENT under Chief Minister Terry Mills. The following announcement was made by the previous Minister for Sports and is no longer relevant. Minister for Sports and Recreation Karl Hampton today hosted sporting officials from across the Asia-Pacific at the Heads of Delegation Meeting. "The Heads of Delegation Meeting is a key planning step towards the 2013 Games," said Mr Hampton. "It is a pleasure to have representatives from Timor Leste, Macau, Chinese Taipei, PNG, Fiji, New Caledonia, Thailand, Vietnam and Indonesia here in Darwin to help mould this great Territory event. "It is also a great boost for Territory sport to have the expertise of members of the Australian Paralympic Committee here at the meeting." Mr Hampton was particularly excited at the prospect of the games taking place on an upgraded Arafura Stadium. "The 2011 Arafura Games will allow Territory track and fields athletes to test themselves against the best from around the South-East Asia and Pacific region at a world class facility; Arafura Stadium. Recently announced upgrades to the track, field, administration and lighting facilities will bring the stadium up to IAAF standard and provide a fitting centrepiece for this magnificent event," said Mr Hampton. The new sport for the 2011 Arafura Games is Twenty20 Cricket, one of the fasting growing sports in the world which will be sure to attract some diverse teams from across Australia and the Asia-Pacific. Athletes, officials and volunteers are now able to register online for the 2011 Arafura Games. Registrations close on Friday, 8 April 2011. 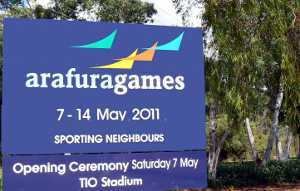 The 2011 Arafura Games will be held from 7 to 14 May 2011 in Darwin. For more information or to register online click here. Return from Arafura Games 2011 to Enjoy Darwin Home.